The School of Nursing and the McAnulty College and Graduate School of Liberal Arts Center for Health Care Ethics are offering a new interdisciplinary PhD in Nursing Ethics. 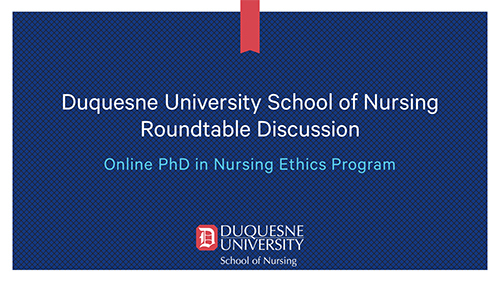 This one-of-a-kind PhD program in Nursing Ethics combines doctoral courses in Nursing and Healthcare Ethics. This online program may be completed in four years, with select residency requirements, including a study abroad component. Every student admitted to the PhD program is required to come to campus for the first residency, usually held during the third week of May. This week includes an orientation to the PhD program and provides an opportunity for students to meet faculty and participate in live classes for the courses in which they are enrolled that summer. Read an article from the recent School of Nursing magazine on ethics - "Doing the Right Thing"